CESC FABREGAS MADE his Arsenal debut in a League Cup game against Rotherham in October 2003. But as much as there was intrigue about the 16-year-old Spaniard, he didn’t grab the headlines that night. Instead, goalkeeper Graham Stack did. Then 22, he had already featured for Don Givens’ Republic of Ireland Under-21 side the previous year. But this was his first senior Arsenal start too and it turned into quite the fairytale. The game went to extra-time and then penalties. It was a long and arduous shootout. It was so long that Stack was asked to step up to the spot and he calmly made it 8-8. Moments later, he saved one and then Sylvain Wiltord converted the winner to send Arsenal through to the next round. Having joined the club as a 10-year-old, it was the culmination of everything and it was a calling card too. Arsene Wenger retained Stack in goal for the remainder of the competition as the side made it to the semi-finals before defeat to eventual champions Middlesbrough. He was part of the Invincible squad, an understudy to Jens Lehmann. He was the back-up. Not Stuart Taylor, not Rami Shaaban. When you look back on photos from the presentation of the Premier League trophy in May 2004, Stack is there – right in the middle of the celebrations – one arm draped around Martin Keown, the other around Ashley Cole. But he never saw a minute of top-flight action. Itching for more first-team action, he went on loan to Millwall the following year before joining Reading permanently, bringing to an end a 14-year affiliation with Arsenal. “Myself and Cesc’s careers have taken slightly different paths since that night – certainly our bank accounts are different, I can assure you of that!” Stack tells The42. When Stack was promoted to the first-team squad, he was walking into a group of imposing, uncompromising, experienced warriors: Lehmann, Keown, Patrick Vieira, Sol Campbell – giants of men. You had the glittering array of world-class talent too: Thierry Henry, Robert Pires, Dennis Bergkamp. “What a season to have been involved”, he says. And he retains a special fondness for Arsene Wenger, the man who gave him his big break. When asked to try and sum up what it was like playing for him, Stack replies with an anecdote. One thing I’ll never forget is when we were playing in the Champions League. It was CSKA away, possibly, and we got a chartered flight. We didn’t get back until late. It was about three in the morning and I went back to the training ground to grab something from my locker and, as I was leaving, he was sitting in his office watching a game. It just summed him up, really. He was always looking to do better or wondering why something hadn’t worked. The man was just total football. “He’s a special, special manager. His demeanour and personality on the training pitch. And he’s got a great sense of humour too, y’know? He makes you want to play well for him and he has this knack of making you want to win. You read the papers – the criticism and bad publicity he gets for his transfer policy or whatever – but when I was there, the players backed him 100%. And he had huge respect from everyone within that dressing room. The 14 years at Arsenal is Stack’s longest stint at a club by quite a distance. He seemed to find it hard to settle after leaving north London. There were loan spells at a litany of clubs before he finally found a home with Hibernian in Edinburgh in 2009. After three years in Scotland, he joined Barnet, was made club captain, began to delve into the coaching side of the game while he was there and racked up well over a century of league appearances. At the end of the season, he was offered an extension to his contract. But he had something else in mind: the Indian Super League (ISL) and a reunion with his former Reading coach Steve Coppell at Kerala Blasters. There were other motivating factors too: the massive attendances, a big TV audience, the shorter four-month season – a big deal for a 35-year-old. But it’s been tough. He’s a long way from his wife and four children who have remained in England. He’s got to know the inside of Indian hotel rooms very well. It can be boring and mundane. The new environment has been a culture shock, an eye-opener. “There’s always something that will surprise or shock you”, he says. We’re in Mumbai at the moment – a very wealthy place with the architecture, the history and it’s also the financial capital of India. On the flip-side, there’s a lot of poverty and there are a lot of slums. You see that when you fly in and arrive at the airport. Next to the runway you’ve got little communities built out of tin and any other material these people can get their hands on. In Calcutta, there were lots of homeless people. Stray dogs, cows in the street, five people on one moped, people driving down the wrong way on a road, no one stops at red lights. It can be chaos. Some of the things you see are unimaginable. But you’ve got to accept it and embrace it. “It’s been hard – missing out on a lot of stuff with the kids. That’s been a real challenge for me but you’ve got to stay positive and remember why you’re here and why you’re doing it. I want to be successful. I haven’t come to the other side of the world for a jolly-up. It’s about making it work for myself and, hopefully, opening a few doors”. The ISL is still in its infancy and an attempt to open the country’s eyes to football. In a cricket-obsessed environment, that’s a tough sell. So, like other developing domestic leagues, stakeholders have turned to some older marquee names to help with the PR machine. Currently, Florent Malouda plays in Delhi. Lucio is with Goa. Helder Postiga is in Calcutta – with former Atletico Madrid goalkeeper Jose Molina as the coach. Other managers include Gianluca Zambrotta, Marco Materazzi and Zico. Stack, who is also part of the coaching staff with Kerala, has his eye on finishing the season as a champion. “We’ve got four games left and we’re third in the league. We probably need four points from our remaining fixtures to get us into the play-offs and then first plays fourth and second plays third over two legs. And the final will actually be in Kerala, where we’re based. So that will be an 80,000 sell-out crowd. Stack is a terrific conversationalist and each colourful story is usually punctuated by a couple of bellowing laughs. He’s seen quite a bit throughout his career and shared dressing rooms with some intriguing characters – something that begun during a loan spell with Beveren in Belgium in 2002. “I was with Yaya Toure when he was 17 and he was just a beast. He was physically developed but he had the footballing brain that you just couldn’t give someone so young. Technically, he was far, far better than anything I’d seen at that age. Steve Sidwell was on loan at the same time and he played in the same position. He couldn’t do much to get in the team because Yaya was such a good player. You look at Siddy’s career and how well he’s done. So Yaya was a special talent and someone I always knew would hit the heights”. At Arsenal, Stack worked closely with Lehmann – someone with a reputation for being difficult and unique. But the pair gelled quickly and there were never any issues between them. But Stack has always wondered why that was. We got on absolutely brilliantly. But I don’t know if that was because he never felt threatened? Did we get on well because he thought ‘Well, Stacky’s not going to play in front of me’? 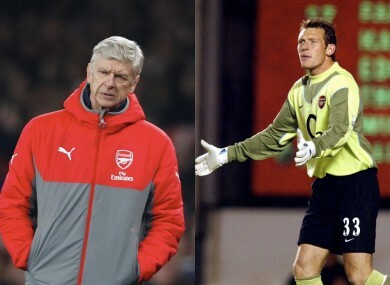 I was a young goalkeeper thinking ‘I’m not going to play in front of Jens Lehmann’. I was happy to be his understudy. He was Germany’s number one at the time and the best goalkeeper in the Premier League in that 2003/2004 season regardless of what anyone says. He was exceptional. He didn’t miss a game. I’m sitting on a bench desperate to play and a 40-odd year-old man was as fit as anybody I’d come across. He wasn’t the most athletic but his strength, power and agility – he’s certainly someone I’ve looked up to. I’m 35 now and tried to model my regime and lifestyle and eating habits on how Jens worked. I learned a hell of a lot from him. We used to do little races on a Friday with (goalkeeping coach) Gerry Peyton and I beat him by running backwards once. When the race was finished, he was still running. Then I realised he was running towards me and trying to kill me! He’d get frustrated if something wasn’t right. You might hit 10 shots clean as a whistle, right down his throat. And then if one was slightly off centre, he’d have the hump. But that was just the standards he had set. That’s how it should be. And the level I needed to get to”. Stack arrived at Barnet in 2012 and just a few month later, Edgar Davids signed for the club. Initially he was a player and joint-coach but took over solely before the end of the year. His time with The Bees was troublesome and short-lived. Stack saw it all up close. “Davids was a massive personality, a big character”, he says. “He was an emotional guy – very emotional. He would do things, say things in the heat of battle or in training – kick players, swear at them. He still thought he was more capable than anyone else. I’m not saying he wasn’t but he wasn’t the player he was 10 years prior, which he was never going to be. As the chat ebbs to a conclusion, I ask Stack about Ireland and whether he caught any of the European Championship games in the summer. “Me and my wife were away in the summer for our tenth wedding anniversary. So, as you do, you try and find an Irish bar to watch the Euro games. We were on the Greek islands and you know how it is.’ Cab driver – Irish bar’. Everyone was an Irishman in there. We had Aussies with Irish shirts on. Everyone just wants to be Irish when Ireland play, don’t they? But it was brilliant. Brilliant to see them do so well”. Stack played seven times for the Under-21s between 2002 and 2003 and he’s always kept an interest in the fortunes of the Irish players he played with and against. “Wes always had unbelievable ability – taking players on, creating chances. He was a little genius, to be fair to him. But he lost his way a little bit and went off the boil. You didn’t hear much about him. But in the last six or seven years, he’s really got his head down and been brilliant – at club level and for Ireland. As Hoolahan prepares for Norwich’s trip to Loftus Road against QPR tomorrow, Stack is studying too. Once he gets off the phone, he’ll give his pre-match notes another scan. It’s a big game against Mumbai City on Saturday. Email “'It was 3 in the morning, I went back to the training ground and he was in his office watching a game'”. Feedback on “'It was 3 in the morning, I went back to the training ground and he was in his office watching a game'”.